It is with a little embarrassment that I write this post, in that I never discovered Coundon Wedge long before. I have been living in Coventry for over 7 years, about 20 minutes walk from Coundon Wedge, but never really knew what it was. Now I have found it I want to keep going back. The sign says it all really, this is a beautiful area of countryside a short distance from the city of Coventry. 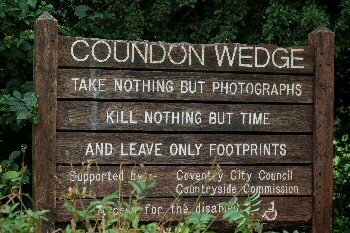 “Coundon Wedge, Take nothing but photographs, Kill nothing but time, And leave only footprints”. This really is a nice area to take a walk. In a relatively small space the area includes grassland, woods, a pond and a whole variety of wildlife, as well as farmland with Horses and Goats. The site is supported by Coventry City Council and the Countryside Commission. 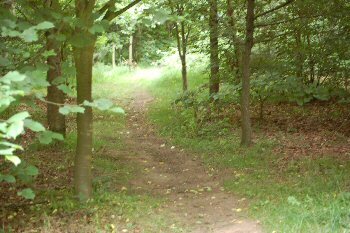 The Coundon Wedge is located just off the A4114 Holyhead Road, between Coundon Wedge Drive and Kingsbury Road, although it can be accessed from other areas as well. See: Multimap map of the area. There are a couple of parking spaces off the Holyhead Road, or Kingsbury road, and adjoining roads are residential roads with on street parking. It’s a great place to go for a walk, and is very popular with dog walkers. There are a whole variety of different paths, with almost endless possibilities for different routes. The horses are friendly and one (which we kept on the other side of a fence), was friendly towards my baby in her pushchair, much to her delight. There is certainly pushchair access, and even disabled access, although for those that are in a wheelchair it probably depends upon the size and maneuverability of the wheelchair and the abilities of any helper. 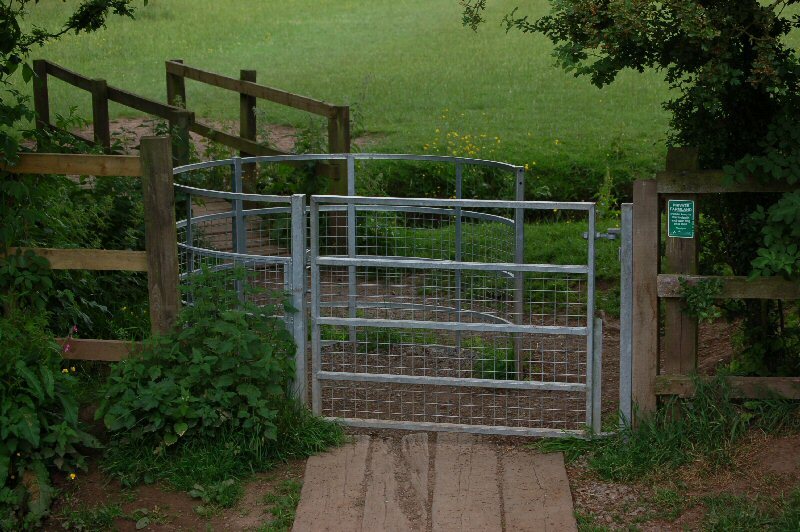 There are some large gates which may provide access to some of the areas for those unable to navigate the gates, you may need to contact the council to see about access. 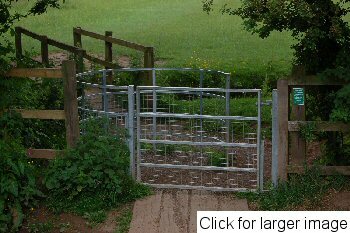 The photos here shows a typical gate that is used frequently around the area. Click the photo to view a larger image. This is a kissing gate, with a large internal area. It is just about the right size for a pushchair, so may be a bit small for some wheelchairs. Some of these are a little overgrown, with nettles growing through into the curved area. In this case you need to be careful not to sting your childs legs if they are in a stroller type of push chair. I have now been a couple of times. On both occasions I’ve taken my baby daughter with me, so I’ve not had much opportunity to take a lot of photographs, and the pushchair usually scares any wildlife away before we get close. It’s a place I’m going to try and visit more frequently. This entry was posted on Sunday, July 23rd, 2006 and is filed under Babies, Coventry West Midlands, General, Tourism. You can follow any responses to this entry through the RSS 2.0 feed. Both comments and pings are currently closed.